Dr. Nourparvar’s unique background combined with his skills as a physician and education has created a unique and perfect combination needed for a Mohel. Dr. Nourparvar has experience in this field for more than 10 years, performing numerous procedures in clinic, hospital and home. 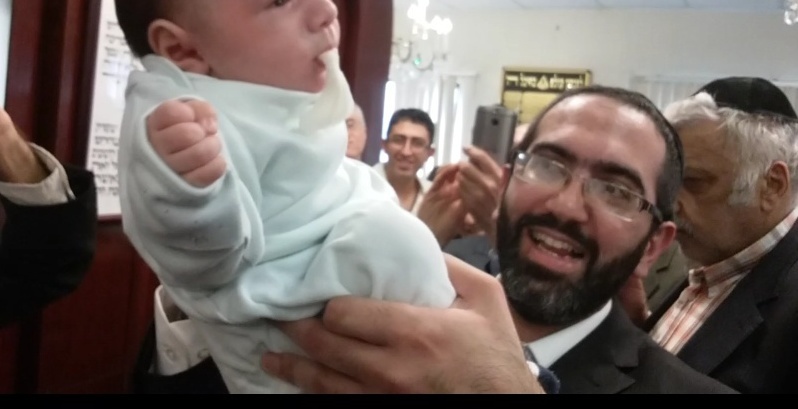 Dr. Nourparvar is available to perform Brit Milah (Ritual Circumcision) or Non-Ritual Circumcision for your newborn in the Los Angeles Area. Most experienced Mohals are fully capable of performing Brit Milah. Now there is an alternative choice for those who only request a Doctor without compromising Jewish laws and tradition. He is available to perform ritual circumcision at home, synagogue, or clinic. We have performed many circumcisions in our private surgical operation room conveniently located Cedar Sinai Medial Office Towers. This large room is ideal for older babies, children teenagers and adults. This room is newly renovated with state of the art new equipment in a sterile and controlled environment. It also has room for larger parties who would like to participate in a bris. We could host 10-30 guest in this room. We could perform a kosher brit milah (Ritual Circumcision) in conditions better than a hospital circumcision. Unlike the hospital circumcision we don’t strap the baby to a board and we have a faster and safer circumcision up to 30 times faster and painless than hospital. We also encourage the parents to be present in the room which is not allowed in hospital and many clinics. Some families later follow the circumcision with a customary meal in the hospital’s Cafeteria or at their home or in a restaurant. 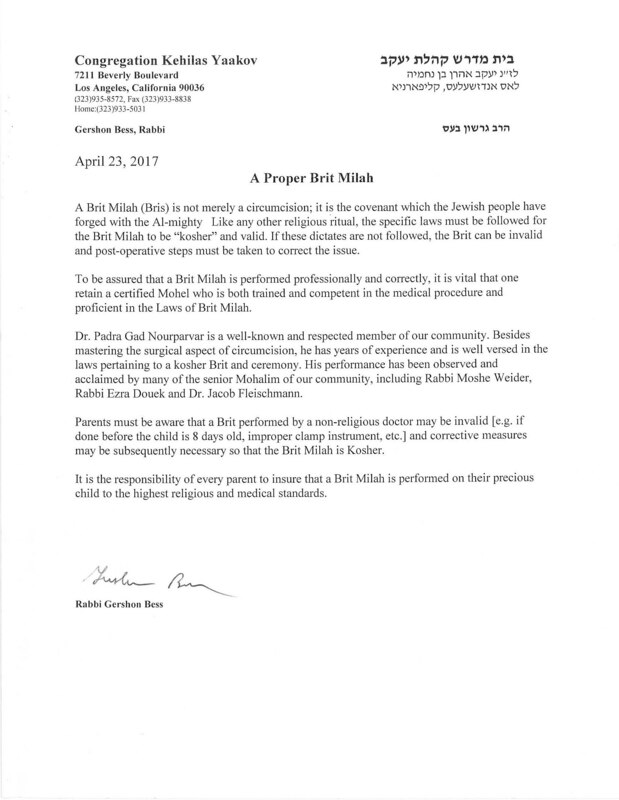 Dr. Nourparvar is currently the only Doctor in Los Angeles who is universally accepted to perform a Bris (Brit Milah) with ceremony. He is also the only physician in Los Angeles who follows the same standards as Rabbanut of Israel. Dr Nourparvar’s education also included Talmudic studies in Ner Israel Rabbinical College. He is also a graduate of Valley Torah High School headed by Rabbi Aron Stulberger. He is well known to Rabbi Menachem Mendel Cunin former Rabbi of Chabad of UCLA & Current Rabbi of Chabad of Larchmont. Currently Dr. Nourparvar is a member of Congregation Kehilas Yakov headed by Rabbi Gershon Bess- a prominent and well known Halachic authority in America and also participates in Los Angeles Kollel headed by Rabbi Chaim Fasman. Any of the above may be contacted as reference. *Legal Dislamor: All product and company names are trademarks™ or registered® trademarks of their respective holders. Use of them does not imply any affiliation with or endorsement by them. This includes UCLA, White Memorial Hospital and CHLA. The trademark holders are not affiliated with us and do not endorse our services. Cedars-Sinai, Cedars-Sinai Medical Office Towers & C-S are registered trademarks of Cedars-Sinai Medical Center Inc., registered in the U.S. and other countries. The trademark holders are not affiliated with us and do not endorse our services.